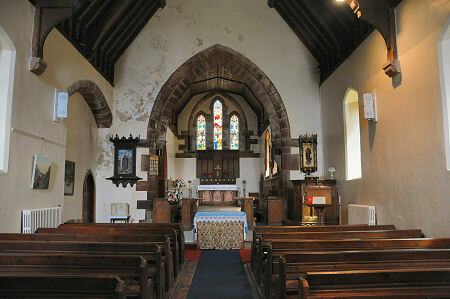 St Bride's Church in Onich stands beside the main A82 a little under a mile north of the Ballachulish Bridge. Opinions seem to differ about whether it should be described as being in Onich or in North Ballachulish: we've followed the Scottish Episcopal Church in going for the former. 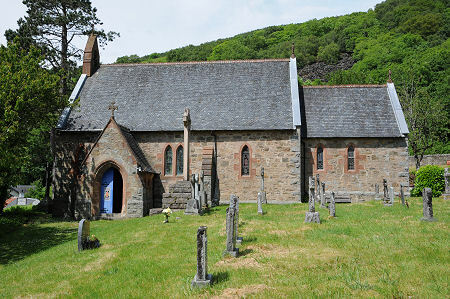 St Bride's is a church within the the Diocese of Argyll & The Isles, one of the seven dioceses into which the Scottish Episcopal Church is divided. The Scottish Episcopal Church is a member of the world-wide Anglican Communion which traces its history back to St Columba and the early days of Christianity in Scotland. Like its sister-church south of the border, the Church of England, the Scottish Episcopal Church is governed by Bishops. This is one of the things that distinguishes it from the much larger Church of Scotland, a Presbyterian Church governed by representatives of the congregation. St Bride's was built in 1875 to a design by the architect J. Garden Brown. Externally it is simple but attractive, and there is a former manse, now a B&B, immediately to the north. The interior of the church is strongly influenced by the Arts & Crafts movement, and some of the detail, such as the tiling on the floor, is extremely attractive. 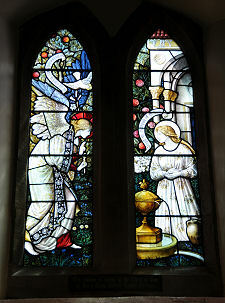 For its size, St Bride's has an especially fine collection of stained glass windows, with perhaps the best being the two light depiction of The Annunciation, by Shrigley & Wilson, added in 1896. The church organ was initially installed by Wadsworth & Bros on the north side of the chancel. It was moved in 1898 to an organ loft at the west end of the church, presumably to create more space in the chancel. Beneath the organ loft is a font with a highly ornate wooden lid. Just to the east of the path leading to the church's porch is an impressive stone cross with ornate Celtic carving. 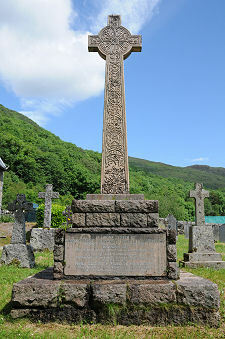 This commemorates Alexander Chinnery-Haldane, Bishop of Argyll and the Isles, who died in 1906. In the angle between the porch and the west gable is another large cross, a near replica of the Oronsay Cross, which commemorates the wife of another Bishop who died in 1913. 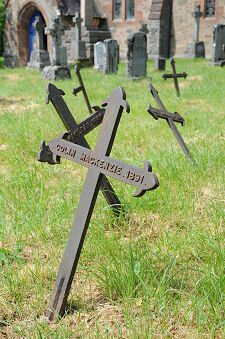 Almost as interesting are the more modest grave markers found throughout the churchyard in the form of simple cast iron crosses with the name of the deceased and their year of death cast in raised lettering. These were clearly popular between the 1870s and 1890s. The rear of the crosses identify the maker as "Dening & Co", and, presumably, the pattern as "Chard No4". This seems to suggest that these crosses were manufactured the agricultural engineering company of that name who were founded in Chard in Somerset in 1865. How Dening & Co came to have such a sales success in Onich for their gravemarkers is a mystery.